Hi friends! Here is a simple,delicious and very healthy recipe of an Indian side dish of yogurt containing roasted and mashed brinjal /baigan/egg plant and spices. Wash well the baigan /eggplant /aubergine with water. Dry with a kitchen napkin. Apply some oil on the baigan and keep it for roasting on an open flame. Keep it turning on the fire after couple of minutes such that the baigan gets roasted on all sides completely. When soft and well roasted from all sides, remove from fire & soak in cold water for peeling the skin. Peel the skin of the roasted baigan. Keep it on the chopping board. Cut the stem of the baigan. Mash the roasted brinjal with a fork. keep aside. When the baigan is getting roasted, take the Curd/Dahi/yogurt in a mixing bowl, whisk it to a smooth texture. Add finely chopped fresh coriander leaves, salt, cumin, pepper, red chili powder and lemon juice to the whisked curd, mix it well. Now, in the spiced curd / yogurt , gently fold in the roasted and mashed baigan/ brinjal/ eggplant /aubergine ,blend well. Refrigerate Baigan Raita till use. Serve cold with Rice dihes, all Indian breads. 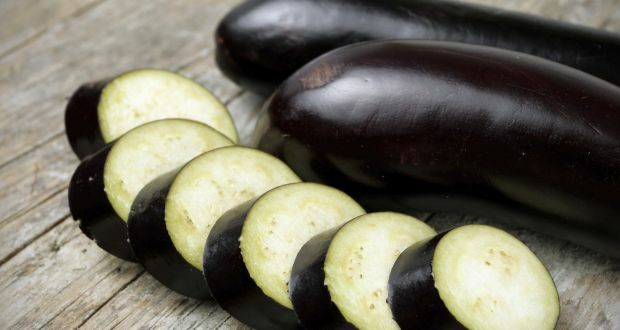 Brinjal or baigan as it is called in India, is a vegetable that is extremely high on nutrients and has many health benefits which makes it something you should try and eat at least once every week. A lot of people don’t like the taste, but if you cook it well, it can be extremely delicious too. Brinjals are great for weight loss as they are low in calories with 100g of the vegetable containing just 25 calories. It is also rich in fiber which helps in eating a small serving which makes you feel full and prevent you from overeating. Being rich in calcium, curd is good for the health of bones as well as the teeth. For those who have difficulty in the digestion of lactose in milk, yogurt is an important source of calcium. Curd contains an enzyme which breaks down lactose to aid proper digestion. Curd / Yogurt is rich in vitamin D which helps our body to absorb and use calcium. Curd / Yogurt helps you feel fuller and is thus, a very good snack for those trying to lose weight. Eating curd / yogurt on a regular basis can help absorb the nutrients in other foods as well. Baigan ka raita is a superb simple very delicious. Thanks for the recipe.